Remember my friend Britt and her company skinnyBLING? Well, Britt has been working hard over the past year on building her brand and now she has so many great pieces in her shop. As you know, I've rocked the mini monogram for awhile now. I also received the floating diamond necklace as a wedding gift from my husband and never take it off! I'm telling you, skinnyBLING is amazing! A chance to win either a mini or tiny sterling silver monogram necklace!!! Use the Punchtab form below to enter. Contest ends 12/8. A discount code. Enter TARTANANDSEQUINS for 10% off until 12/8. And because Britt would really like to get the word out about skinnyBLING, we are also offering extra entries to those who visit skinnyBLING on Etsy and pin their favorite item. After you've pinned, just leave a comment below with your email address saying you've pinned an image and we'll add that entry to your account. 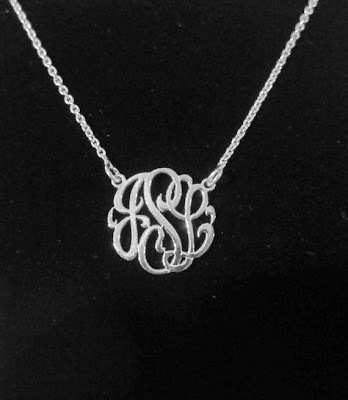 I really love the classic mini monograms. I think silver. I pinned it! I pinned the Small 14k Gold Monogram Necklace...I absolutely love it and have wanted it ever since I saw it on you months ago! I hope I win so I can get a necklace that says CIP! Beautiful jewelry! I pinned the diamond curved bar necklace, so pretty! So pretty! I pinned the sideways cross. Beautiful neckline, I will want to have one.